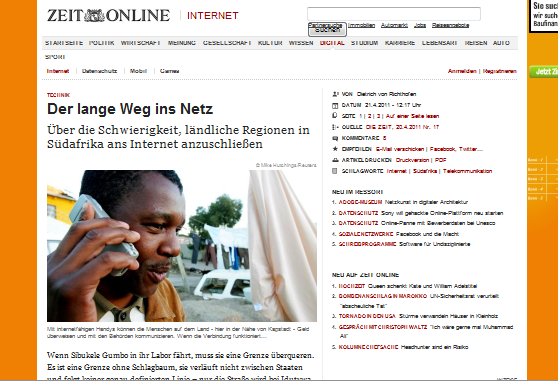 Popular and prominent German weekly newspaper, featured the following article entitled ‘Der lange Weg ins Netz’ written by free lance journalist, Dietrich von Richthofen about the Siyakhula Living Lab and Reed House Systems. The English translation of the article was also featured in the June/July 2011 issue of The African Times. This article came after Dietrich’s visit to Grahamstown and Dwesa at the beginning of February 2011. This afforded him the opportunity to interview Siyakhula Living Lab’s extended team, especially the community members whom he met at the Digital Access Nodes in the rural Transkei. When Sibukele Gumbo drives to her laboratory, she must cross a border. It is a border without a barrier, it does not separate states and it does not follow a well-defined line – only the road becomes a little more bumpy at Idutywa and leads deeper into the undulating grasslands of Wild Coast, a coastal county of the Eastern Cape Province in South Africa right in the middle of the former Transkei homeland. "Welcome to information-locked country," says Gumbo, as we turn from the main road onto a rutted mud- and gravel road – welcome to the country that is excluded from the modern flow of information. The aim of the computer scientist is to dismantle this invisible border that runs between Wild Coast and the information society. The next hill reveals a panorama view onto rolling hills where silvery-green grass is blowing in the wind. They are dotted with huts in light blue, mint green and bright purple. Cows and goats trot on narrow trails between them. But as idyllic as the landscape appears, as torn is the social and economic reality. During the apartheid the black African population living in the homelands was largely excluded from the development of the rest of South Africa. Today up to 90 percent of the inhabitants in the region, who are by majority Xhosa, are unemployed or live from odd jobs. The average income – which mainly consists of pension payments, social assistance and remittances from economic migrants – is just little more than 90 € per month. Supply of running water and electricity is the exception. Sibukele Gumbo and her colleagues from the Centre of Excellence of the South African telecommunications company Telkom SA aim to provide the local people with new opportunities for social and economic participation – by connecting them to global mobile phone and data networks. Therefore they set up a "Living Lab", a sort of test laboratory, where researchers develop innovations by involving the future users. The Siyakhula Living Lab – Siyakhula means "we grow together" in the local isiXhosa language – includes five schools and the villages in their catchment areas. All together an area of 25 square kilometers that is inhabited by 25,000 people. Projects like this have already existed since the 1990s. However, with the rapidly increasing access to the Internet and mobile telephony in the ‚developing countries‘ they can be implemented on a large scale nowadays. A real community has grown around the topic, global corporations like Nokia, Microsoft or SAP, multinational industrial and financial organizations, government institutions and countless start-ups and non-governmental organizations (NGOs) are involved. The abbreviation for the trend: ICT4D – Information and Communication Technologies for Development. From health care, to economic inclusion, to education and democratic participation – for every issue on the development agenda one may find appropriate online applications. Farmers sell their potato harvest by mobile phone via a trading platform directly to caterers. Slum dwellers coordinate their purchases by sending SMS to a central server. Microcredit is just a mouse click away. "The revolution in information technology is just starting," predicts Philippe Dongier, head of the sector Information and Communication Technologies (ICT) at the World Bank. "In a few years, the majority of Africans, Latin Americans, South Asians and people of other developing countries will have a small mobile computer at their fingertips – connected to the Internet." In Siyakhula Living Lab the hope for prosperity and growth is up to one single satellite dish on the roof of the Mpume Junior Secondary School. From there a WiMAX network, a kind of outdoor Wi-Fi, passes it on to the other four schools. Unfortunately, when we visit, the entire Living Lab has been offline for one week, Teressa Mqikela, a teacher in the Senior Secondary School in Ngwane, complains. Sibukele Gumbo and her colleagues came to restore the connection. They approach every schools individually to detect the error. The car of the Living Lab is well known, people are waving cheerfully everywhere. The virtual connection to the rest of the world raises great expectations. Mqikela tells the the story of a 80-year-old man who rode his bike for several hours just to ask if he can send his grandson to her school. "Since we have been connected to the Internet the number of our students has doubled," she adds. Cynthia Gxarisa is someone who already benefits from the connection. The mid-fifties woman sits in the staff room of the Junior Secondary School Mpume and places her phone on a weathered wooden table where tattered textbooks are piled up. Two years ago she did not know exactly what the Internet was – today she transfers money to her children and completes administrative formalities online. She has even registered her own business – a catering service for local schools – with the tax office via an online form. "This Internet is changing our lives," she says. Gxarisa was used to go to Dutywa for each transaction – about 70 kilometers upcountry. Because of the poor public transport connections and the terrible state of the roads, this usually took her a day. If she was out of luck and the bank was offline, she had to come back another day. "By using the Internet we save a lot of time and money," states Gxarisa. But will the advent of modern communications structures bring sustainable growth? Proponents of ICT4D point to studies showing a correlation between the diffusion of communication technologies and economic growth. A report on the national development of Kenya published by the World Bank in late 2010 attributes almost 25 percent of the Kenyan economic growth to the rapidly growing ICT sector. Several long-term studies conducted in single regions seem to provide further evidence: Harvard economist Robert Jensen has already shown in 2007 that the dissemination of mobile networks can significantly increase the economic success of Indian fishermen. Equipped with mobile phones the fishermen could access information on the actual supply and demand in the ports and thus increase their profits on average by eight percent. Yet computer scientist Kentaro Toyama is still sceptical. In his opinion Jensen‘s results are highly limited in their validity as they might not be applicable to other markets. "Market participants have easy access to various markets as they can call at different ports with their boats, the reality of most agricultural markets looks different," argues Toyama, who led the research group Technology for Emerging Markets at Microsoft Research India until 2009. Today Toyama works at the School of Information, University of California at Berkeley, where he critically deals with ICT4D projects in development aid. For him the major mistake of many projects is the misbelieve that technology could provide solutions on its own. Most people who are active in this field would come from backgrounds where a highly developed infrastructure, a functioning financial system, excellent logistics and the necessary skills in dealing with technology exist. "As a result many people tend to overlook the variety of factors that influence the success of a project in a different environment – from logistical issues about cultural differences to local political power struggles." Toyama is no critic of the fundamentals. Nevertheless he believes that the money for most large scale projects, which for instance equip schools with computers for many millions of dollars, could be spent more efficiently by investing into the training of teachers and the acquisition of books. The failure to put the focus solely on new technologies were repeated cyclically, states Toyama and recalls the euphoria of the 1960s, when it was believed that television is the new magic bullet in the fight against illiteracy and the lack of education. »50 years later, we see that TV has done merely a marginal contribution – if any at all," says Toyama. His conclusion, "Technology can enhance existing skills and efforts – but can not replace them." There are groups in the ICT4D scene who want to learn from the mistakes of the past. One group is MobileActive, a New York-based network of activists whose aim is it to utilize mobile phones and the Internet for social change. Since last year the members have organized the FailFaire competition. In this competition it is not the best project that is awarded, but the one that failed most fulminantly – so to speak the Golden Raspberry Award for Internet-related development assistance. Project managers present their failed projects and explain which mistakes have been responsible for the failure. The winner of the last meeting was Michael Trucano who is in charge for Information and Communication Technologies in Education and Training at the World Bank. He presented the ten biggest mistakes he has come across during his work with the World Bank and was awarded with an XO-1 – the minimalist notebook of the initiative One Laptop per Child (OLPC), which is seen by some as a prime example for a technology-centric, autocratic approach. Alfredo Terzoli maintains a self-critical approach to success and failure as well. The head of South African Telkom Centre of Excellence is sitting in an Italian trattoria in the High Street in Grahamstown. From here – about 250 kilometers west of the Siyakhula Living Lab – the activities in the project are coordinated. "We technologists tend to regard technology as the solution," admits the native Italian who has spent 20 years in South Africa. It were therefore important to involve sociologists, anthropologists, linguists and representatives of other disciplines. "We must listen to what they have to say." Terzoli deals with the difficulties openly. For example an online order for hand work has been received in Siyakhula Living Lab, the client wanted to have 140 necklaces. "When the day of delivery came up, not even half was done – as there were no pearls remaining for the rest," he says. Numerous communication barriers have to be overcome. Many people in the area are illiterate, many only speak isiXhosa. "Imagine if the entire Internet were in Chinese and almost all contents dealt with problems in China – then you get an idea of ​​how inaccessible and useless the network appears for many people here," says Terzoli. An emphasis is therefore put on the training of ‚champions teachers‘ which acquire skills in using computers and the Internet via special courses and later pass their knowledge on to students and other community members. In addition, the programmers of Reed House Systems, a company that is also involved in the project, develop an online portal for the people in the Siyakhula Living Lab. It will be translated into isiXhosa and made available to illiterates via audio menus. The inhabitants of the region can create personal Internet profiles, communicate with other members, send information to state agencies, offer hand work for sale, search for job, design resumes for applications or advertise their homes on tourist websites. "There is considerable potential for tourism in the area," says Terzoli. The Dwesa-Cwebe-protected area lies, for example, a few kilometers away from the Living Lab. The traditional beading could be another basis for business. However, the teething problems of the project must be solved first. The Internet connection is disrupted again and again. Very few people have electricity at home, so from time to time someone unplugs the server to charge his cell phone. Dust and heat cause problems for the computers. Sometimes a school does not recharge the prepaid account for the electricity, so the servers are cut off from power while operations are running. This time the network interface card in Mpume had a quite fatal crash, the hardware burned out because of the electricity fluctuations. In such cases the team goes out in a day trip to exchange the parts – if the roads are not washed out from the rain and therefore impassable. The way out of the Siyakhula Living Lab into the information age is tough. However, for Sibukele Gumbo this is an incentive : "If our concept works here, it works everywhere."